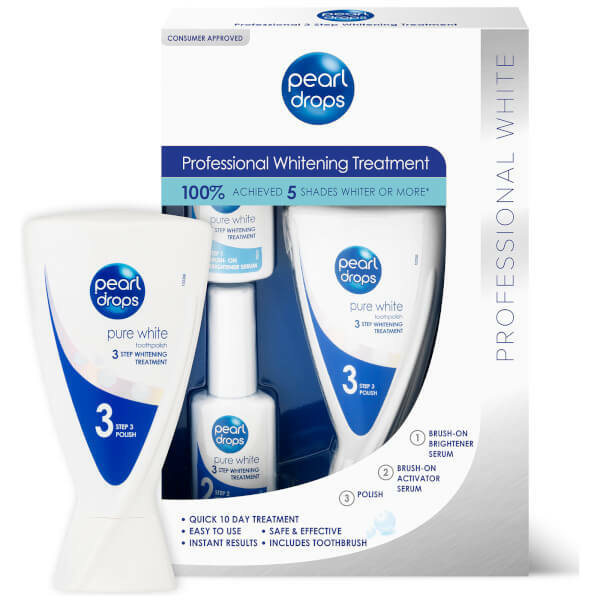 Reveal a brighter, whiter, healthier-looking smile with Pearl Drops Professional 3 Step Whitening Treatment. Quick, gentle and safe to use, the three-step teeth whitening system allows you to polish and perfect your teeth in the comfort of your own home. Delivering instant results, the Pure White oxidising activator and brightener serums have been specially formulated to help remove stains and restore natural whiteness. Working in synergy with the whitening toothpaste, you can expect to witness pearly whites. Equipped with a toothbrush for effective brushing. 100% of people achieved five shades whiter or more*. *Based on a 10 day self-assessment research of 100 women aged 24-45. Preparation: Gently brush teeth with your usual toothpaste. Step 1: Shake the Brush-on Brightener Serum (bottle 1) for 3-5 seconds. Apply the Brush-on Serum to the front and top of the teeth and leave for 30 seconds. Be careful not to remove the Brightener Serum with your lips or tongue. Step 2: Shake the Brush-on Activator Serum (bottle 2) for 3-5 seconds. Apply the Brush-on Activator Serum to the front and top of teeth and leave for 30 seconds - be careful not to remove the Activator Serum with your lips or tongue. After 30 seconds rinse with water, for optimal results, now wait for 20 minutes without eating, drinking or smoking. Step 3: Apply a pea sized amount of Professional White toothpolish (bottle 3) to the toothbrush and brush teeth for 2 minutes. Apply treatment once per day for 10 days. Brightener Serum: Aqua, Sodium Chlorite. Activator Serum: Aqua, Propylene Glycol, Xylitol, Xanthan Gum, Sodium Benzoate, Mentha Piperita Oil, Phosphoric Acid, Disodium EDTA, Limonene, CI 77891. Professional White Toothpolish: Hydrogenated Starch Hydrolysate, Aqua, Hydrated Silica, Glycerin, Alumina, Sodium Dodecylbenzenesulfonate, PEG-12, Aroman, Pentasodium Triphosphate, Pentapotassium Triphosphate, Zinc Peroxide, Cellulose Gum, Sodium Fluoride, Sodium Saccharin, Pearl Powder, Limonene, CI 74160, CI 77891. Contains Sodium Fluoride (1300ppm F).